A Vermont heirloom root crop with a long story as well as a long history. John Gilfeather first began selling his farm-original rutabaga, calling it a 'turnip' (as rutabagas are often called in Vermont), in the late 1800's, jealously protecting his propriety by careful trimming of the tops and roots to prevent "unauthorized reproduction" of his genetic treasure. Fortunately for his Precious, some seeds eventually escaped Gilfeather's hoard, and were commercialized by a market farming couple unrelated to the Gilfeather family. The name was thereafter protected by a registered trademark until 1995, when the trademark was allowed to lapse. Such efforts to keep control of open pollinated seeds seem quaint today, when the dominant model of protection has become the legally heavy-handed Utility Patent. The genetic story is also interesting. The bachelor Gilfeather's "turnip" is actually an interspecies cross between a rutabaga (Brassica napus) and a true turnip (Brassica rapa). Such crosses are uncommon, but occur at a rate of 1% or less when the plants flower together in close quarters. Mr. Gilfeather's discovery likely resulted from keeping his own seed on the farm, and paying attention to the 'off-types' that can result from doing so. I can relate. This is how I became a plant breeder. 'Gilfeathers Turnip' leaves have the color and shape of rutabaga, with a good kale-like flavor. 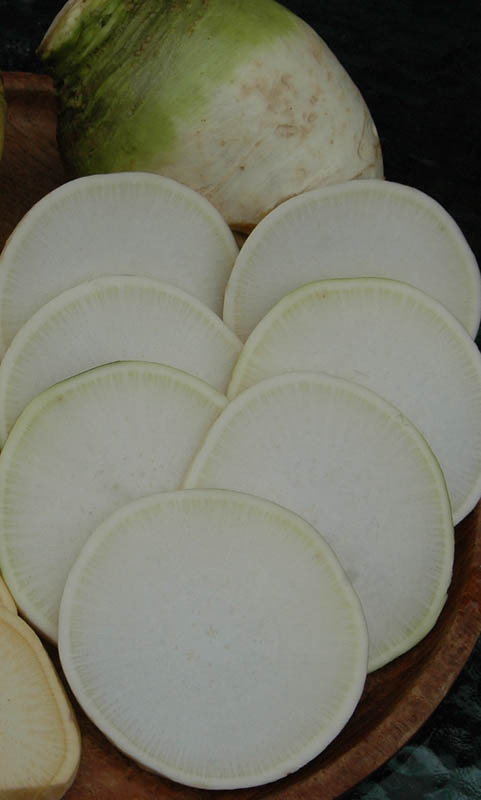 The root is shaped like a football rather than a sphere, lacks the purple top of both common turnips and rutabaga, has the color of a white turnip (as opposed to the yellowish flesh of common rutabaga), with a texture and flavor intermediate between the two. When cooked and mashed, the color and texture would mislead many to think of mashed potatoes. The flavor is mild, with less of the sulfurous taste that we associate with the Brassica family. When allowed to grow to seed, the seed plant has a close-branched architecture like a turnip with flowers almost identical to Siberian kale and rutabaga.